Foreclosed homes present many opportunities …and many challenges. almost certainly that will have to have lots of repairs before it will be ready for you to move in. and good schools for a faction of what it otherwise would cost. This is one of the instances that an experienced real estate professional can make or break the difference. Negotiating this type of transaction does require some experience and do recommend that you select a REALTOR® early in the process. One the best moments to buy a foreclosed home is when it first goes to auction at the courthouse steps. It is when the house can be attained at the lowest price. It is a quick moving procedure and lenders are still not equipped to make decision that quick. If you have cash on hand, pre inspect the home you want to bid and had to county courthouse step on the first Tuesday of each month (as long as it is not a holiday). It is a quite interesting thing to see. The majority of foreclosures will return to the original financial institutions that financed the house in the first place. In the process of “reacquiring” the house the bank also clear the title to extent that it becomes more marketable and, consequently, it is more likely to be approved for financing. VA (Veterans Administration) does not like to finance homes that will require extensive repairs and definitely will not back homes that will have repairs beyond the closing date. Before you hit the road to pursue your foreclosed homes – do take the time to prequalify with a reputable lender. Most of the good homes worth biding on will sell quickly – so it is preposterous for you to be looking for houses if you still do not have secured financing. It takes a couple days or more for you to get that qualification back and it may already be too late. Do yourself a huge favor: Get a prequalification behind – sometime it is emotional devastating to find a great house and loose for this simple thing – which you will need to do down the road any ways. A good house when it hits the market at the right price or bit below, will attract many suitors …very quickly. It is important to have that prequalification letter form you mortgage lender in hand and act on your offer as your decision is made …and you cannot take you sweet time to make that decision though. When a house hits that “sweet spot” numerous people will be in hot pursuit and you may end up what I dread the most – a “multiple offers” conundrum (or the “bid wars,” if you prefer). All the sudden the price goes ways beyond the initial “good” price. a) Do not get emotionally attached to the home until you have had your offer accepted be the seller… actually up to that point I do not call it a “home” but simply a “house” or a “condo” – if that is what we are working on. I try to protect mu clients “emotional well-being” as well. Until I get the acceptance of the offer I try to keep it “all business.” b) “Highest and Best” – when banks get multiple suitor for their foreclosed homes the often will ask for those buyers to submit their best and highest offer. You will then rethink your price and concessions like closing costs. I always ask my clients to think that on their first offer… but it rarely happens. I think that people do get attached to house and will up their offers and/or drop the concessions. I warn you - be careful with your emotions. Invariably foreclosed homes will call for repairs and/or upgrading. Banks will not make any repair and they will not give any concessions like some for paint, carpet or missing appliances. I have never seen an exception so please do not count on it. Please factor in those needed repair as well as the extent that you would like to go consideration when placing your offer. I recently visited some foreclosed condos with one of my clients. Prices seem to be very competitive, however some condos needed to be completely redone and others where date – almost all of them lacked granite counter tops and stainless steel appliances. So please think carefully before placing your offer. 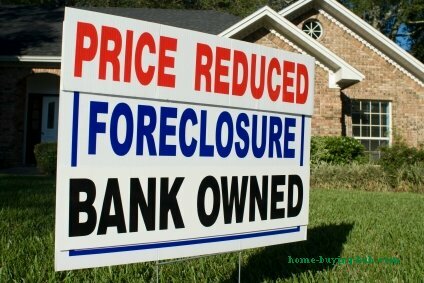 Abundant Inventory – foreclosures have always been around and nowadays the market is flooded with them. Clear Title – you should not worry about it, if the sale goes through you will receive a good title.